Testosterone levels in men decrease with age. However, previous trials examining the effect of testosterone treatment have produced equivocal results. A panel at the Institute of Medicine of the National Academy of Science, therefore, recommended a set of clinical trials to determine the benefits of testosterone replacement on symptoms and age-associated conditions in this population. The Testosterone (T) Trials were a coordinated series of seven double-blind, placebo-controlled trials (RCT) conducted at 12 academic centers in North America designed to answer this question. Eligible men were ≥65 years with a total serum testosterone concentration that averaged <275 ng dl−1 on two measurements, and at least one of decreased libido, difficult walking or low vitality. Key exclusion criteria include pathological hypogonadism, and high cardiovascular or prostate risk. Remarkably, it was necessary to screen 51 085 men to enroll 790 participants meeting all criteria. Only 14.7% of the men with blood samples had a sufficiently low testosterone level to qualify for the study. Sixty-three percent of the participants were obese, 72% had hypertension, 37% diabetes, and 15% a previous myocardial infarction. Men were randomly assigned to receive testosterone gel, adjusted to maintain the serum testosterone level within the reference range for young men, or placebo gel for 12 months. 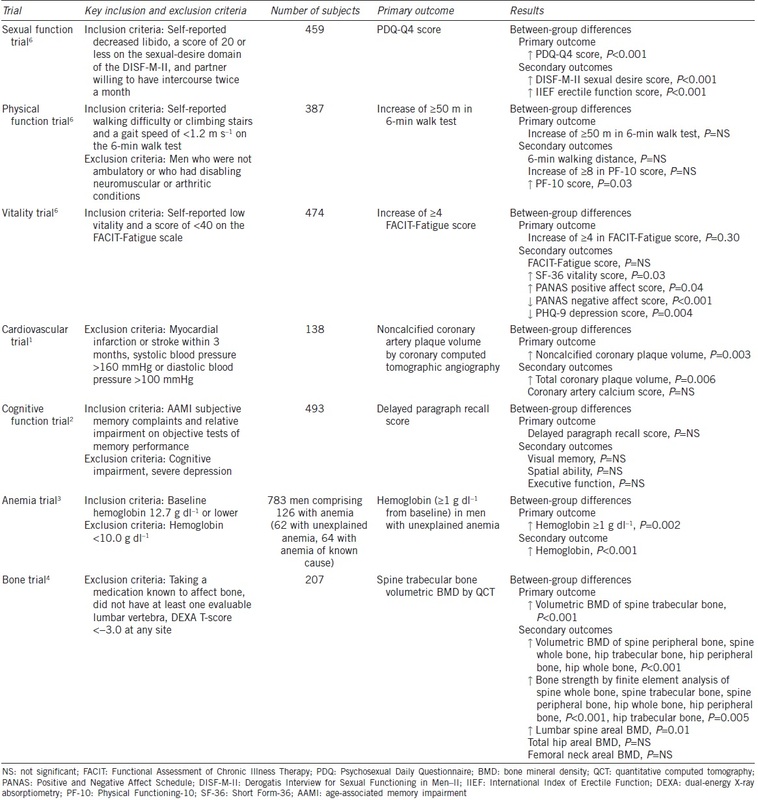 Initial results of the Sexual Function Trial, Physical Function Trial and Vitality Trial were published in the N Engl J Med in 2016 ([Table 1]). In the February 2017 issue of the JAMA, Budoff et al. reported the findings of the Cardiovascular Trial. This trial assessed the effects of testosterone treatment on noncalcified coronary artery plaque volume by coronary computed tomographic angiography measured in a subset of 138 men at baseline and at the end of the 12-month RCT. In these men with relatively high coexisting comorbidities, testosterone treatment was associated with a significantly greater increase in noncalcified plaque volume from baseline to 12 months, rather than reducing this potential early marker of cardiovascular risk. However, the predictive value of coronary artery plaque volume for future cardiovascular events is unclear, and a 3-year RCT in a different population of older US American men with lowered testosterone levels showed no effect of testosterone treatment on carotid artery intimal media thickness. In the same issue of the JAMA, Resnick et al. reported the results of the Cognitive Function Trial, which examined the effect of testosterone replacement on verbal memory and other cognitive functions in 493 men with low serum testosterone and evidence of age-associated memory impairment at baseline. After 12 months, testosterone produced no benefit in the primary outcome measure of the delayed paragraph recall score, or in the secondary outcomes of visual memory, executive function, or spatial memory. The results of the remaining two trials were published in the JAMA Intern Med. The Anemia Study analyzed the effect of testosterone replacement in 126 men with anemia, of which 62 had unexplained anemia. Testosterone treatment increased the hemoglobin levels in men both with unexplained anemia or anemia from known cause. In explanatory analyses, changes in hemoglobin levels were associated with increases in vitality and walking distance, but effects were small and below cut-offs considered clinically meaningful. However, the authors reported that greater increases in hemoglobin levels were associated with the trial participants global impression in overall health and energy, pointing to the possibility that the increase in hemoglobin levels (overall 0.83 g dl−1 [95% CI: 0.48-1.39]) might be of clinical significance. Moreover, the findings indicate that androgen deficiency should be excluded in men with unexplained anemia by measurement of their testosterone levels. Finally, the Bone Study reported the results of 207 participants and demonstrated that testosterone treatment significantly increases volumetric bone mineral density (BMD) and estimated bone strength, more in trabecular bone than peripheral bone and more in the spine than the hip. Baseline mean BMD by DEXA was normal in these men. Long-term studies are required to establish if this equates to a reduction in fracture risk. To date, the T trials provide the best evidence available on the short-term effects of testosterone treatment in older men without pathological hypogonadism. These high-quality trials were rigorously designed and conducted, and randomized carefully selected older men with both clinical as well as biochemical evidence of androgen deficiency. However, the T trials were not designed to evaluate long-term risks. Overall, the results were mixed: on the one hand, testosterone treatment provided modest improvements in sexual function and some aspects of mood, and increases in bone density and bone strength, and in hemoglobin levels. On the other hand, testosterone treatment had no benefits on cognitive function, on overall vitality or physical activity, and of potential concern, increased coronary artery plaque. The clinical implications of these findings are not yet clear, and larger studies are needed to determine clinically important benefits and potential long-term risks of testosterone treatment, such as on cardiovascular and prostate heath, fracture rates, and functional independence. The low enrollment to screening ratio in the T trials is consistent with findings from the European Male Aging Study (EMAS), which reported a 2.1% prevalence of late-onset hypogonadism, lower than previous studies using less stringent criteria. Moreover, in both studies,, men had relatively high rates of comorbidities, including obesity and diabetes. Whether coexisting comorbidities contribute to androgen deficiency like symptoms and lowered testosterone levels is unknown. However, there is modest evidence suggesting that optimizing comorbidities, and especially weight loss can, in addition to general health benefits, increase testosterone levels, and improve androgen deficiency like symptoms in older men. Therefore, lifestyle measures and meticulous care of comorbidities should be the cornerstone focus within the context of a holistic approach to age-related hypogonadism, irrespective of whether testosterone treatment is considered or not. Budoff MJ, Ellenberg SS, Lewis CE, Mohler ER 3 rd , Wenger NK, et al. Testosterone treatment and coronary artery plaque volume in older men with low testosterone. JAMA 2017; 317: 708-16. Resnick SM, Matsumoto AM, Stephens-Shields AJ, Ellenberg SS, Gill TM, et al. Testosterone treatment and cognitive function in older men with low testosterone and age-associated memory impairment. JAMA 2017; 317: 717-27. Roy CN, Snyder PJ, Stephens-Shields AJ, Artz AS, Bhasin S, et al. Association of testosterone levels with anemia in older men: a controlled clinical trial. JAMA Intern Med 2017; 177: 480-90. Snyder PJ, Kopperdahl DL, Stephens-Shields AJ, Ellenberg SS, Cauley JA, et al. Effect of testosterone treatment on volumetric bone density and strength in older men with low testosterone: a controlled clinical trial. JAMA Intern Med 2017; 177: 471-9. Snyder PJ, Ellenberg SS, Cunningham GR, Matsumoto AM, Bhasin S, et al. The testosterone trials: seven coordinated trials of testosterone treatment in elderly men. Clin Trials (London, England) 2014; 11: 362-75. Snyder PJ, Bhasin S, Cunningham GR, Matsumoto AM, Stephens-Shields AJ, et al. Effects of testosterone treatment in older men. N Engl J Med 2016; 374: 611-24. Basaria S, Harman SM, Travison TG, Hodis H, Tsitouras P, et al. Effects of testosterone administration for 3 years on subclinical atherosclerosis progression in older men with low or low-normal testosterone levels: a randomized clinical trial. JAMA 2015; 314: 570-81. Wu FC, Tajar A, Beynon JM, Pye SR, Silman AJ, et al. Identification of late-onset hypogonadism in middle-aged and elderly men. N Engl J Med 2010; 363: 123-35. Grossmann M, Matsumoto AM. A perspective on middle-aged and older men with functional hypogonadism: focus on holistic management. J Clin Endocrinol Metab 2017; 102: 1067-75.